When is applying the long-established rules of Locus Standi (The right or capacity to bring an action or to appear in a court) and the letter of the law “undemocratic”, “dictatorial” or trying to “over-rule 750 year history of representation”? Never – unless you live in the weird parallel universe inhabited by Andrew Gilligan and the rest of the anti Hs2 mob! As I predicted in my last blog, the petitions to the House of Lords are facing far more Locus Standi challenges than the earlier petitions to the Commons. 414 of the 821 are subject to challenge. This has provoked squeals of outrage from stophs2 campaigners and the usual fact-free rubbish from Andrew Gilligan (see here) and Joe Rukin (here). Of course, what they all neglect to say it that whilst this is the Govt and Hs2 Ltd bringing the challenges, it’s up to the House of Lords Committee to judge if those challenges should be allowed. The Committee is Chaired by Lord Walker of Guestingthorpe, who just happens to be a QC with a long history of senior judicial appointments which include being a High Court judge, Justice of Appeal, Lord of Appeal and Justice of the Supreme Court of the UK. With such an august legal mind Chairing the Committee it’s going to be almost impossible for Hs2 antis to get away with screaming ‘foul’ on this one – hence their anger. So, what’s happened shouldn’t come as a surprise to anyone. The Govt and Hs2 Ltd are simply exercising their legal right to challenge petitioners standing and a very senior and experienced legal mind is chairing the Committee that will rule on their validity. Expect the majority of the challenges to succeed. Much excitement was generated amongst those of us who follow the HS2 debate by the spectacle late last year of the House of Lords Economic Affairs Committee investigating the economic case for HS2. Or not. After seeing the Chairman, Lord Hollick, simpering over Martin Tett of Buckinghamshire County Council and the failing 51m group of local authorities, expectations of objective and informed analysis rather faded. •	For an airline, the marginal costs of flying compared with the fixed costs of being an airline are high, so you don’t fly unless you can fill your plane, and a regular interval service means having the same flight times two days in a row. •	By contrast, for a railway, the variable costs of running a train are low compared with the fixed costs of having a railway to run on, so it’s worth running a train so long as the extra fares match those small extra costs, and a regular interval service throughout the day is a key factor in generating income. That’s been common knowledge since the Brighton line electrification in 1932 – to everyone except ex-Chancellors of the Exchequer, apparently. Lord Lawson (that’s Nigel Lawson, famous mainly for setting off the inflation of the late 1980s by shadowing the Deutschmark until, sadly too late, told not to by the Prime Minister) then confirmed the depth and subtlety of his knowledge by repeatedly suggesting that HS2 was only being proposed so that we could boast of having the fastest trains in Europe, an allegation that depends for supporting evidence on his own imagination. And possibly on the fact that he lives mainly in France these days. This detachment from reality was reinforced by the constant refrain that pricing can spread peaks of demand to the point of not needing extra capacity – as if most of us have any choice when we travel to work. Unsurprisingly, given this naivety on the part of Their Lordships, the very real benefit of HS2 for the commuters who will inherit the West Coast Main Line was dismissed as if it was a disadvantage of the project, instead of a measure to address growth from locations such as Leighton Buzzard, Milton Keynes and Northampton on about the only route into London where significant new housing can be accommodated. Thank heavens for Lord Deighton, giving evidence, who declared in respect of capacity that in his experience, the more people knew about capacity, the more convinced they were that there was a capacity problem on the WCML and beyond. Cue cries of “vested interests” from the opposition! In attempting to minimise the regeneration benefits of infrastructure projects such as HS2, the committee were clearly influenced by the Institute of Economic Affairs, who have just broken cover with a report proposing the conversion of railways into roads – something that will probably not play well in the Chilterns as of course it was the Chiltern line that was proposed, and rejected, for such a conversion back in the 1980s. The IEA attempted to dismiss regeneration benefits on the basis that Doncaster is still depressed despite having a good train service to London, but neither the IEA nor the Committee had the wit to wonder what a town whose industries were based on building wooden railway carriages and steam locomotives to pull them would now be like without a good rail service to London. If the Committee seemed ignorant of life and the economy North of Hampstead, this was rubbed in first by Richard Wellings of the IEA (yes, that IEA) who diagnosed the problems of the North as being due to “poor human capital” – that means “people” to anyone except a think-tank – then by Lord Carrington’s suggestion that HS2 would be building a station “in the wilds of Yorkshire”. He couldn’t name this alleged station, of course, but presumably meant Meadowhall – an established transport interchange adjacent to the M1, served by three railways, a tramway and numerous bus routes, and 10 minutes by frequent trains from Sheffield Midland station. Yorkshire, happily, still has wilder wilds than that! At other times, having summoned a variety of busy people to entertain it, the Committee didn’t seem to know who it was actually talking to and why. Michele Dix of Transport for London was closely questioned about Network Rail’s plans for the rebuilding of Euston, in which TfL no doubt have an interest, but for which they have no responsibility. The issue had simply been in the news that morning, and the Committee just asked the first person they saw. Michele Dix also made clear that TfL regarded Crossrail 2 as essential full stop regardless of HS2, and that the link with HS2 Phase 1 was purely a matter of construction programming. 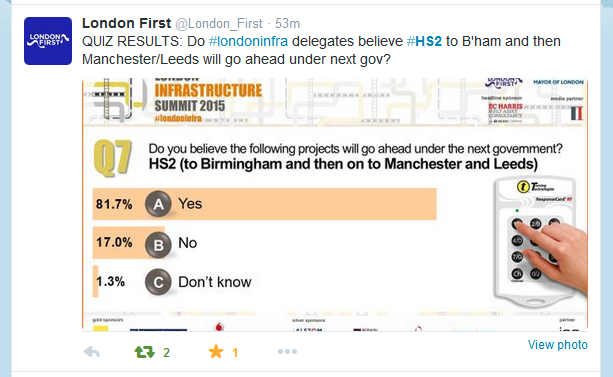 Probably again prompted by the discredited IEA who are determined to add the costs of Crossrail 2 to those of HS2 (but not its benefits, of course), the Committee seemed determined to ignore her in favour of their preconception that HS2 made Crossrail 2 essential. Then, when getting excited about the impact of fares on choice of route, the Committee didn’t realise that sitting in front of it were the very people who could enlighten them, in the form of representatives from Virgin Trains and London Midland. No-one actually thought to ask how the Birmingham business splits between Virgin’s fast expensive trains to Euston and London Midland’s slow cheap ones. The noble Lords instead speculated at length about demand on SouthEastern’s services from Kent, where choice of route depends at least as much on which terminus you can walk to work from as on speed and price. Lord Carrington then excelled himself by suggesting that HS2 was “just a punt”. Well, welcome to the real world, where judgements have to be made about what people will do in the future, “people” and “the future” being about the least predictable things I can think of. But people with responsibilities, as opposed to Lords who enjoy the luxury of sitting back and pontificating, can’t use that as an excuse for doing nothing in the face of real problems such as HS2 addresses. For a Committee that couldn’t cope with uncertainty about the future, though, its enthusiasm for the nascent driverless cars was a surprise. What relevance exactly do they think driverless cars have to long-distance rail demand? Do they really think that just because people wouldn’t have to steer down the M1, they are willingly going to suffer (and thus add to) the congestion on the Edgware Road from the M1 into central London? If driverless cars have any relevance at all, they sound to me like a rather good way of accessing railway stations – such as Meadowhall. Perhaps the whole affair was typified by Lord May (an Australian, which would presumably upset Frank Dobson MP who likes to run down HS2’s Sir David Higgins on the basis of his nationality). This heavyweight (speciality – theoretical ecology) played to the Twitterati by declaring that he wouldn’t trust HS2 to mow his lawn. Not that he’d interviewed anyone from HS2 at that point, of course, but never let knowledge get in the way of a soundbite. Not wishing to respond in a similar churlish vein, may I say that I would happily trust Lord May and his colleagues with mowing my lawn – but not with anything to do with economics.